Pit stains and wet marks don't just plague people with	hyperhidrosis. Even if you only pit out from time to time, there’s nothing more embarrassing than flashing yellow sweat stains when waving to a friend, co-worker or boss. Here is the complete guide to yellow pit stains, what causes them and how you can banish them from your life for good. If you’re reading this article, you’ve most likely tried several tricks to contain your sweat and stop yellow sweat stains. You might avoid colored dress shirts (like the dreaded baby blue button-down) and stick to white ones that don’t show sweat marks as well. But opting for white shirts only makes you susceptible to the formidable yellowish stains that appear after a few good sweats. The obvious solution is to slab on more underarm protection. The more the better, right? In fact, adults who use deodorant do so an average of 8.6 times per week. And for those between 18 and 24, that average jumps to 9.2 uses per week, according to Mintel International. Or, you might reach for the heavy-duty antiperspirants, which are shown to reduce sweating by up to 20 percent. However, this seemingly innocuous habit could be the source of those pesky sweat stains. Together your antiperspirant, sweat and cotton undershirt are a deadly yellowing combination that make those tough to get out. Yellow pit stains are caused when odorless, colorless sweat reacts with aluminum in antiperspirants. Aluminum is the active ingredient in most heavy-duty antiperspirants, and sweat also contains protein. Together your antiperspirant, sweat and cotton undershirt are a deadly yellowing combination that make those pit stains tough to get out. It's why yellow pit stains appear on your white undershirts or dress shirts after only a few intense sweats. Although most deodorants are aluminum-free, overusing deodorant can still produce yellow stains. Get more facts about sweat. Contrary to that lingering smell that may follow you throughout the day, sweat is actually odorless. The foul smell we know all too well is actually the result of bacteria living on the skin. Deodorants and antiperspirants work to combat this bacteria in different ways. Deodorants mask the smell by killing bacteria that metabolize the proteins and fatty acids. Antiperspirants contain aluminum compounds that block the pores and prevent bacteria from metabolizing the odor-causing proteins and fatty acids. Antiperspirants essentially dry out sweat, which can cause irritation for those with sensitive skin. If you need extra protection — but are also concerned with reducing yellow sweat stains — Klima Hyperdri Antiperspirant Serum is the world’s first aluminum-free antiperspirant/deodorant. Although we haven’t tried it, the reviews seem positive. According to the site, it takes one week of daily use to see a decrease in perspiration and four weeks of daily use to achieve full protection. In the business world, yellow armpit stains aren’t just embarrassing — they’re also distracting. How could your boss, potential client or professor possibly focus on your brilliant presentation when every time you raise your arm, a glaring yellow stain is staring back at them? 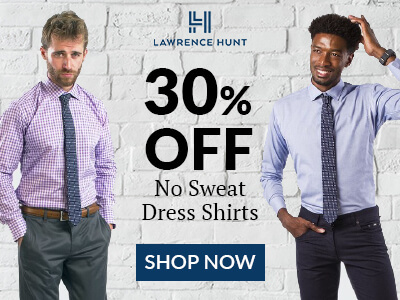 Then you have to consider the wear and tear that sweat stains inflict on your nicest dress shirts and the cost of replacing them every few months. This can add up to hundreds — even thousands — of dollars each year. Pit stains just aren’t pretty. And no one should have to toss out dress shirts and T-shirts like yesterday’s lunch. Thompson Tee sweat proof shirts have empowered me to wear deodorant instead of forcing my pits to endure constant redness and irritation from clinical-strength antiperspirants. Made from premium combed cotton and rayon from bamboo, Thompson Tee undershirts can endure the most intense sweating events and up to a year’s worth of washes. The sweat proof Hydro-Shield technology is integrated into the underarms of every Thompson Tee. The barrier traps sweat and releases it as vapor — meaning no more yellow pit stains. To see how Thompson Tee has helped others preserve their clothes and combat their biggest sweating nightmares, check out our testimonials page, or try one for yourself! What are your favorite deodorants or other ways to stop sweat? We'd love to hear your opinions in the comments below!